I would like to begin with an observation: this is an issue at both ends of the theological-political spectrum. 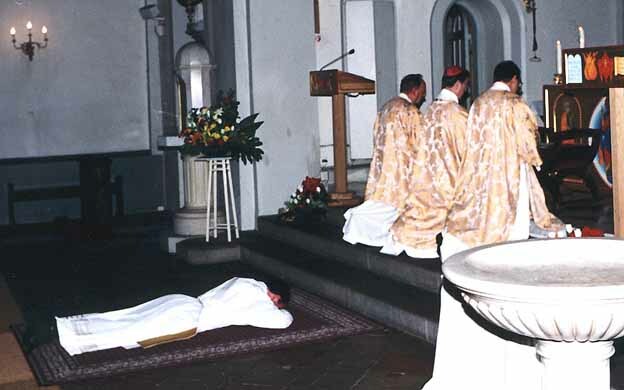 While it may be more common now for new priests to be more “rigid” in their application of liturgical norms, we also have a history of those who have been much too “lax” in their approach to applying the same. Both would claim the “desire to do the right thing” as their motivation, and both—regardless of intention—can harm, and have harmed, the Church. Is it an issue of maturity? On the one hand, there may be an inability to think outside of black-and-white categories, or a desire for security that is, in the end, illusory. If so, assuming that time alone will be corrective may be a dangerous assumption. Those attitudes may, instead, be perpetuated in the seminary environment. Such candidates need to be challenged early in their formation. …..
Br.dokumentar. De første britiske fotografene som var med inn i de tyske konsentrasjoinsleirene i april 1945, møtte en sjokkerende virkelighet. Først nå, 70 år etter krigen, blir disse bildene vist i en nyprodusert dokumentar. Kjente regissører som Alfred Hitchcock og Sidney Bernstein var med å dokumentere dødsleirene, men filmen ble stanset av britiske myndigheter av hensyn til samarbeidet med Tyskland etter krigen. I dag vises filmen på en rekke TV-stasjoner i forbindelse med den internasjonale Holocaust – dagen. Jeg fant videoen hos New Litugical Movement. The meetings with families and young people at Manila, were salient moments of the visit to the Philippines. Healthy families are essential to the life of society. It gave us consolation and hope to see so many large families that welcome children as a true gift of God. They know that every child is a gift of God. I heard it said that families with many children and the birth of so many children are among the causes of poverty. It seems to me to be a simplistic opinion. I can say that the main cause of poverty is an economic system that has removed the person from the center and put the god of money there; an economic system that excludes, that always excludes, children, the elderly, the youth, without work…- and that creates the throwaway culture that we live in. Recalling the figure of Saint Joseph, who protected the life of the “Holy Child,” so venerated in that country, I reminded that it is necessary to protect the families that face different threats, so that they can witness the beauty of the family in God’s plan. It is also necessary to defend them from the new ideological colonizations, which attempts threatens their identity and their mission. Søndag 25. januar kl 08.00 feires den tradisjonelle latinske messen i St Hallvard kirkes kapell. Det er 3. søndag etter åpenbaringen som feires, og alle messens tekster og bønner kan leses her. Og da Jesus var gått inn i Kapernaum, kom en høvedsmann til ham og ba ham og sa: “Herre, gutten min ligger lam hjemme og lider meget.” Jesus sa til ham: “Jeg skal komme og gjøre ham frisk.” Og høvedsmannen svarte og sa: “Herre, jeg er ikke verdig til at du går inn under mitt tak. Men si bare ett ord, så blir gutten min frisk. …. Og Jesus sa til høvedsmannen: “Gå, og det skal gå som du har trodd.” Og gutten ble frisk i den samme timen. Mer informasjon om disse messene her. Dokumentet “Dominus Jesus” under angrep? “In the face of the firestorm that had developed around ‘Dominus Iesus,’ John Paul II told me that he intended to defend the document unequivocally at the Angelus. He invited me to write a text for the Angelus that would be, so to speak, airtight and not subject to any different interpretation whatsoever. It had to be completely unmistakable that he approved the document unconditionally. “So I prepared a brief address: I did not intend, however, to be too brusque, and so I tried to express myself clearly but without harshness. After reading it, the pope asked me once again: ‘Is it really clear enough?’ I replied that it was. 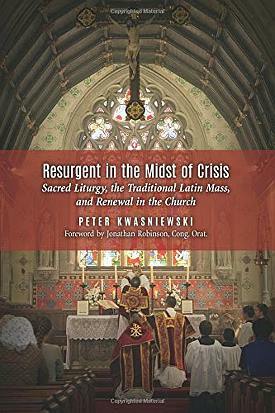 PETER KWASNIEWSKI has taught and written on a wide variety of subjects, especially the thought of Saint Thomas Aquinas, sacramental and liturgical theology, the history and aesthetics of music, and the social doctrine of the Church. After teaching at the International Theological Institute in Austria, he joined the founding team of Wyoming Catholic College, where he currently serves as Professor of Theology and Choirmaster. For twenty-five years Dr. Kwasniewski has also been a director of choirs and scholas, a cantor, and a composer. He writes regularly for The Latin Mass and several popular Catholic weblogs. … I wish to reflect on the peculiar beauty of the very ancient custom of the silent canon and how it confirms the intuition that the Word comes to us in the liturgy in a personal mode that transcends the notional presence of the Word obtained by reading individual words from a book. 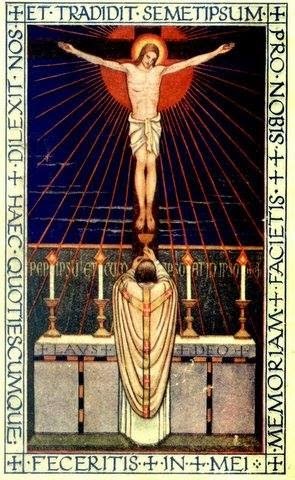 The Introit quoted above strikingly brings together both of these points: the coming of the Word Himself in the midst of total silence. Les hele denne artikkelen her. Et bilde fra min prestevielse i St Paul kirke i Bergen 8. januar 2000. Jeg ligger på gulvet under allehelgenslitaniet, og biskop Gerhard Schwenzer kneler mellom menighetens to diakoner.